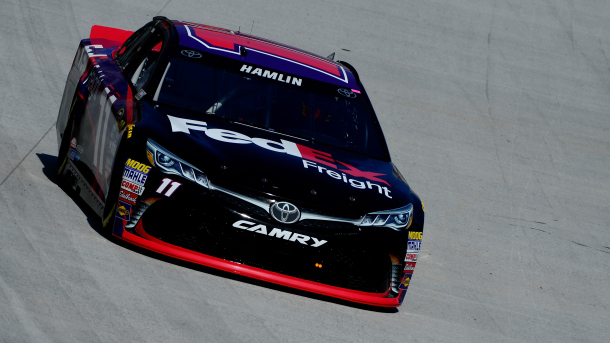 Denny Hamlin, with a lap speed of 128.666 MPH, was the quickest early Friday afternoon in the first 2016 NASCAR Sprint Cup Series (NSCS) practice session for Sunday’s Food City 500 at Bristol Motor Speedway (BMS). Second quickest with a lap speed of 128.399 MPH was Martin Truex Jr., and he was followed by Brad Keselowski (128.374 MPH) who was third, Jimmie Johnson (128.176) fourth and Jamie McMurray (127.767) was fifth. Rounding out the top-10 quickest drivers in the session were Kevin Harvick (127.724 MPH) who was sixth, Dale Earnhardt Jr., and Kyle Busch (with the identical lap speed of 127.478 MPH) recorded seventh and eighth respectively, AJ Allmendinger (127.444) ninth and Carl Edwards (127.377) posting the 10th-quickest lap speed. The teams will return to the track at 4:15 p.m (ET) on FOX Sports 1 for qualifying to determine the starting lineup for Sunday’s race, and it is Denny Hamlin who currently holds the qualifying track record at BMS with a lap speed of 131.407 MPH – which he set last year on August 22nd. 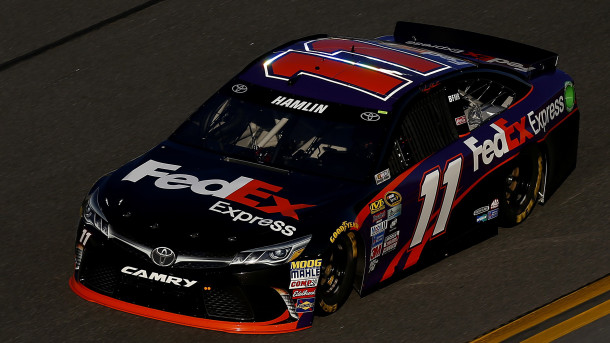 The 2016 Daytona 500 race winner, Denny Hamlin – with a lap speed of 188.450 MPH – showed the fastest way around Atlanta Motor Speedway (AMS) Saturday afternoon during the final NASCAR Sprint Cup Series (NSCS) Folds of Honor QuikTrip 500 practice session. Runner-up in last week’s 500-miler, Martin Truex Jr., was second fastest in the session with a lap speed of 188.226 MPH, and he was followed by Jimmie Johnson (187.297 MPH) who was third, Dale Earnhardt Jr. (187.095) fourth and series Rookie of the Year (ROTY) candidate, Chase Elliott (186.963) was fifth. Defending series champion, Kyle Busch (186.679 MPH) was sixth-fastest, while Jamie McMurray (186.347) was seventh, Casey Mears (186.115) eighth, Kurt B.usch (186.084) ninth and Ryan Newman (185.947) rounding out the top-10 fastest drivers in the “Happy Hour” (final) practice. 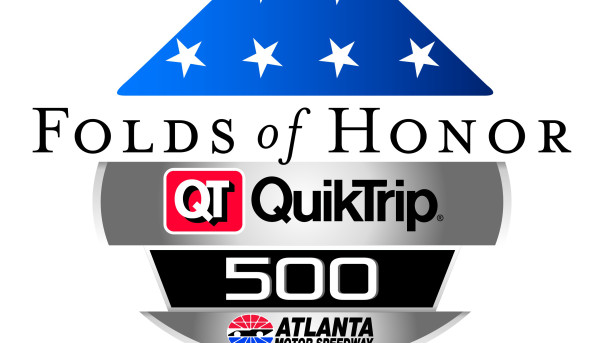 The 57th annual Folds of Honor QuikTrip 500 is scheduled to get started around 1:20 p.m. (ET) Sunday afternoon, and television coverage of the race will be provided by FOX Sports 1. 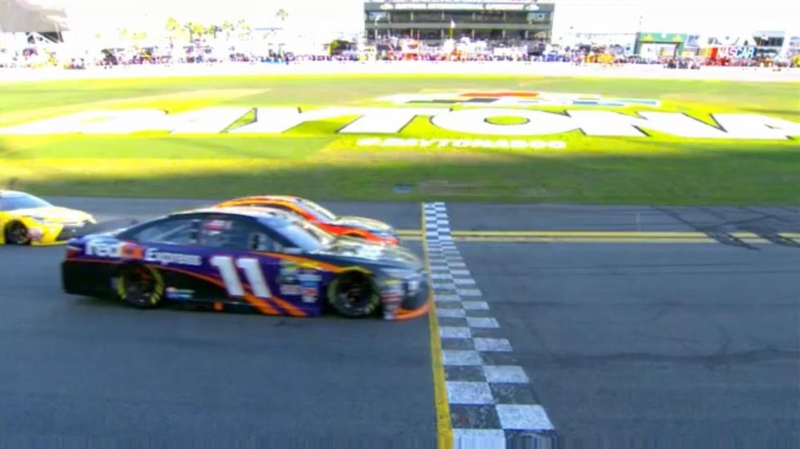 In a thrilling race finish Sunday to start off the 2016 NASCAR Sprint Cup Series (NSCS) season, it was Denny Hamlin holding off Martin Truex Jr. – by 0.010 seconds – to win the 58th annual Daytona 500 at Daytona International Speedway (DIS). 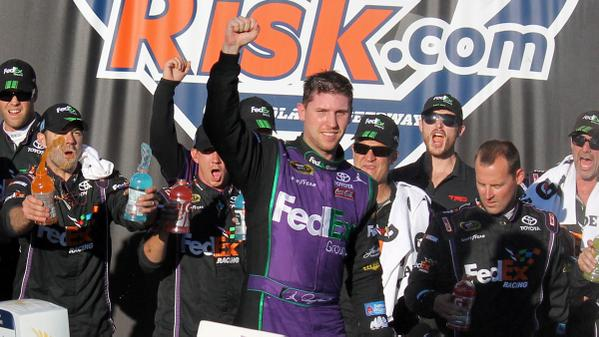 Hamlin, who also led the most laps – 95 out of 200, received his 27th series career win in 363 races, his second series win in 22 races at DIS, and gives himself, Joe Gibbs Racing and Toyota their first Daytona 500 win. 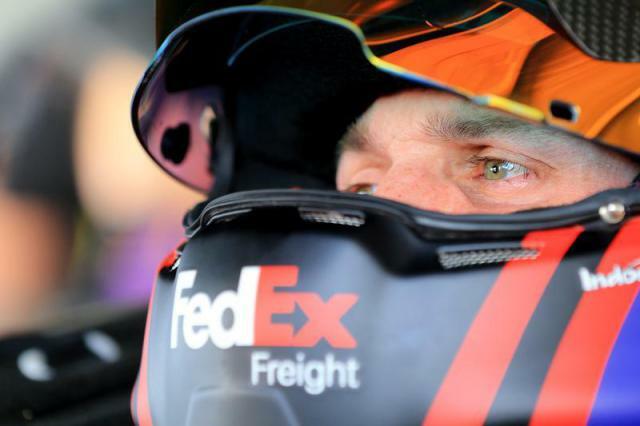 By winning the Sprint Unlimited (non-points race) last Saturday night, and now the Daytona 500, Hamlin becomes the sixth driver to win them both in a season joining Lee Petty (1959), Richard Petty (1973), Cale Yarborough (1977), Jeff Gordon (1999) and Dale Jarrett (2000). Following Hamlin and Truex to the drop of the checkered flag were the defending series champion, Kyle Busch finishing third, Kevin Harvick fourth and Carl Edwards finished fifth. 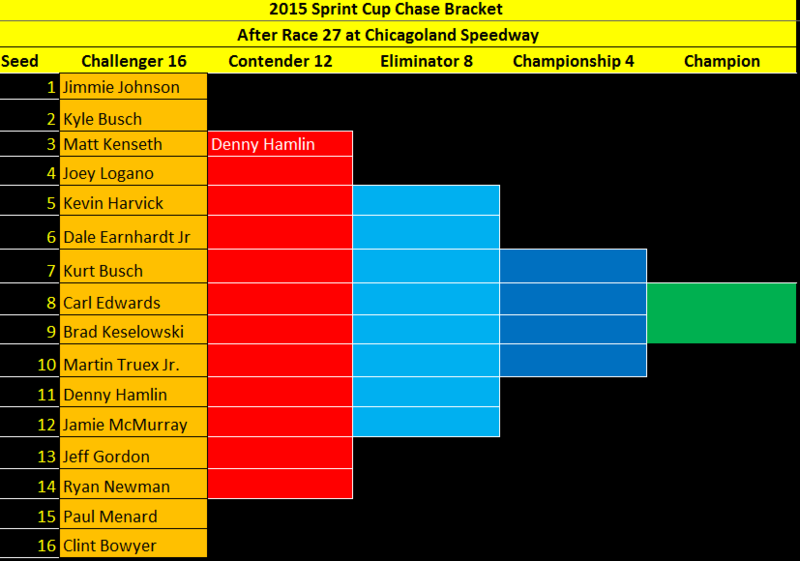 Last year’s race winner, Joey Logano, brought home sixth-place, while Kyle Larson finished seventh, Regan Smith eighth, Austin Dillon ninth and Kurt Busch rounding out the top-10 finishing positions. Ryan Blaney was the highest finishing rookie with his 19th-place finish. With his victory, Denny Hamlin leaves Daytona with the points lead and with a 5-point lead over Martin Truex Jr.
Time of Race: 3 Hrs, 10 Mins, 25 Secs. Up Next: The series heads to the Atlanta Motor Speedway for the Folds of Honor QuikTrip 500 on Sunday, Feb. 28th, with an approximate starting time of 1:20 p.m. (ET) and television coverage provided by FOX. Denny Hamlin tops the charts after Friday’s final ‪‎DAYTONA 500‬ practice. Seven 2016 NASCAR Sprint Cup Series (NSCS) Daytona 500 practice sessions are now “in the books” at Daytona International Speedway (the eighth/final session to take place on Saturday), and at the end of the seventh session Friday afternoon, it was Denny Hamlin – with a lap speed of 199.658 MPH – leading the practice. Defending series champion, Kyle Busch and driver Martin Truex Jr., ran the identical lap speed of 198.640 MPH and were recorded second and third fastest respectively, while Carl Edwards (198.610 MPH) was fourth and Matt Kenseth (198.566) was fifth fastest. Series Rookie of the Year (ROTY) contender, Ryan Blaney (196.498) had the sixth-fastest lap speed, and he was followed by Joey Logano (196.412) who was seventh, Trevor Bayne (196.386) eighth, Ricky Stenhouse Jr. (194.839) ninth and Jamie McMurray (194.696) posted 10th. The teams will have their “Happy Hour” (final) practice early Saturday afternoon from 12:15 p.m. – 1:55 p.m. (ET), with television coverage provided by FOX Sports 1. The 58th annual Daytona 500 is set to get started around 1:00 p.m. (ET) Sunday, Feb. 21st, with television coverage provided by FOX. Saturday’s Sprint Unlimited at Daytona International Speedway ended with a mere handful of cars undamaged—and race winner Denny Hamlin’s Toyota wasn’t one of them. But Hamlin got his wreck out of the way early in a two-car incident with Ricky Stenhouse Jr.’s Ford on Lap 13 and won the race in overtime with a large swatch of silver tape on the right side of his No. 11 Joe Gibbs Racing Camry. Hamlin triumphed in the season-opening non-points event for the second time in three years (and third time overall) and gave JGR its fourth Sprint Unlimited victory in the last five years. Under NASCAR’s new overtime rules, which require the leader to reach an overtime line on the backstretch under green on the restart lap before the race is official, the event ended under caution for a six-car wreck in Turn 1. The overtime extended the race four laps past its scheduled distance, and, by then, Hamlin had a comfortable lead—if any lead on a superspeedway can be considered comfortable. Joey Logano came home second, Paul Menard third and Kyle Larson fourth in a race that saw only four of the 25 cars avoid wrecks that collectively produced seven cautions for 25 laps. Hamlin chose the outside line for the final restart, abandoning help from JGR teammate Matt Kenseth, who restarted fourth in the outside line. A wild seven-car crash on Lap 23 severely damaged the cars of several pre-race favorites, including the No. 88 Chevrolet of Dale Earnhardt Jr. In his first competitive run as a substitute for injured Tony Stewart, Brian Vickers spun while barreling into Turn 1 after his right rear tire went flat. Vickers’s spin ignited the wreck that also crippled the cars of Earnhardt, Kevin Harvick, Clint Bowyer and also involved the Ford of Greg Biffle and the Chevrolet of AJ Allmendinger. Vickers’ Chevy took a hard hit against the outside SAFER barrier, but the driver of the No. 14 appeared unhurt in the incident. “I cut a right rear tire,” Vickers said after exiting the infield care center. “It’s unfortunate. I don’t know how I cut the tire. I had a little contact. Everyone was racing hard. It’s the Sprint Unlimited, right? That’s what it’s all about. The 18 (Kyle Busch) and I got together early on, going four-wide. Had a little rub but it went away so we thought everything was fine. Lap 44 marked the end of the race for Jimmie Johnson, who spun on the backstretch after contact with the No. 13 Chevy of Casey Mears and tore the front fascia of his No. 48 Chevrolet while sliding across the bus stop chicane used in the Rolex 24 at Daytona sports car race. But Johnson had run near the front up to that point, and crew chief Chad Knaus was pleased with the effort. Time of Race: 1 Hrs, 32 Mins, 16 Secs. Caution Flags: 7 for 25 laps: Laps: 14-17 (#17, 11 Accident Turn 2); 24-29 (#14, 15, 16, 4, 88, 47, 41 Accident Turn 1); 45-47 (#13, 48 Accident Backstretch); 58-61 (#1, 5, 47, 31 Accident Backstretch); 67-69 (Fluid On The Track); 74-77 (#2, 18, 13, 19, 43 Accident Backstretch); 79-79 (#78, 20, 1, 16, 2, 10 Accident Turn 1). Lead Changes: 12 among 3 drivers: 0; B. Keselowski 1-10; J. McMurray 11-24; B. Keselowski 25; D. Hamlin 26-32; B. Keselowski 33; D. Hamlin 34-35; B. Keselowski 36-47; D. Hamlin 48-51; B. Keselowski 52; D. Hamlin 53-62; B. Keselowski 63; D. Hamlin 64-79. In the final 2016 NASCAR Sprint Cup Series (NSCS) Sprint Unlimited practice session, it was Denny Hamlin – with a (drafting) lap speed of 198.930 MPH – posting the fastest lap Friday night at Daytona International Speedway. Clint Bowyer was second fastest in the session with a lap speed of 195.253 MPH, and he was followed by Aric Almirola (194.885 MPH) who was third, Brian Vickers (194.805) fourth and Kevin Harvick (194.763) was fifth. Rounding out the top-10 fastest drivers in the “Happy Hour” (final) practice were Kurt Busch (194.611 MPH) who was sixth, Danica Patrick (194.527) seventh, Paul Menard (194.342) eighth, Austin Dillon (194.280) ninth and Brad Keselowski (193.665) posting the 10th-fastest lap speed. 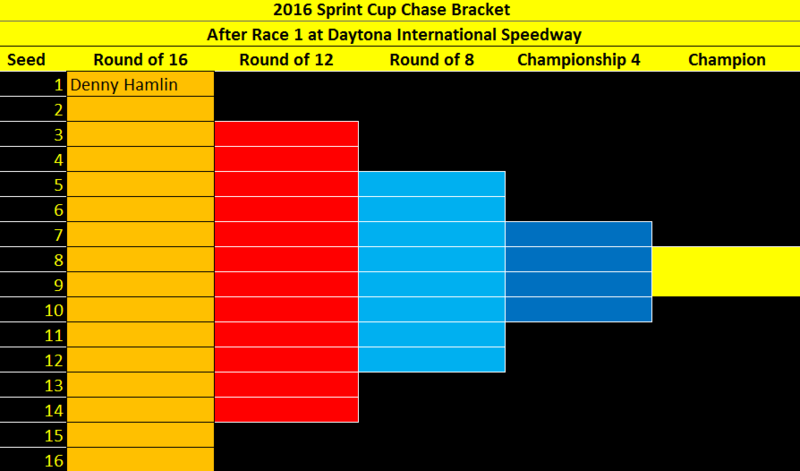 The Sprint Unlimited is scheduled to get underway around 8:00 pm (ET) Saturday evening, and FOX will provide television coverage of the event. Denny Hamlin and Carl Edwards made it a one, two Joe Gibbs Racing (JGR) finish Sunday at Chicagoland Speedway, as Hamlin finishes 0.962 seconds ahead of Edwards to win the NASCAR Sprint Cup Series (NSCS) myAFibRisk.com 400. 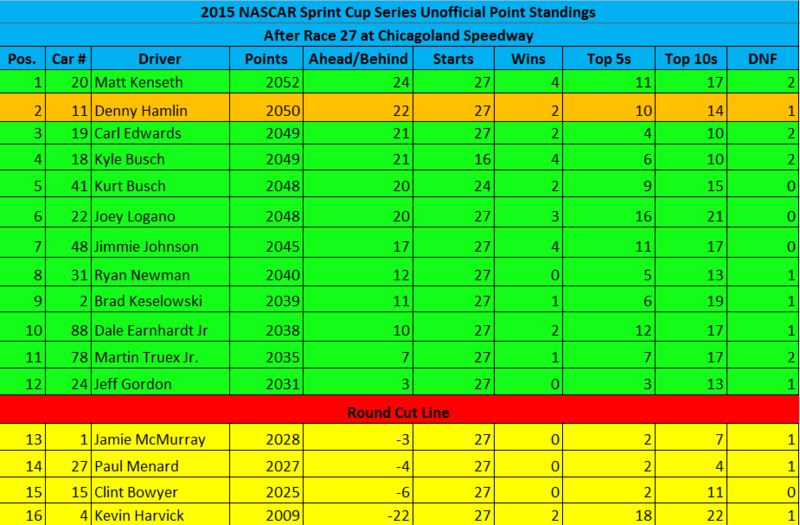 Hamlin, who will advance to the Contender Round with his victory, received his second series win and 14th top-10 finish of the 2015 season, his 26th series career win in 353 races and his first series win in 10 races at Chicagoland. Following Hamlin and Edwards to the drop of the checkered flag were Kurt Busch finishing third, Ryan Newman fourth and Matt Kenseth finished fifth. Rounding out the top-10 finishing positions were Joey Logano taking sixth, Kyle Larson seventh, Brad Keselowski eighth, Kyle Busch (led the most laps – 121 out of 267) ninth and Aric Almirola claimed 10th-place. With his fifth-place finish, Matt Kenseth leaves Chicago as the points leader with a 2-point lead over Denny Hamlin and a 3-point lead over Carl Edwards.